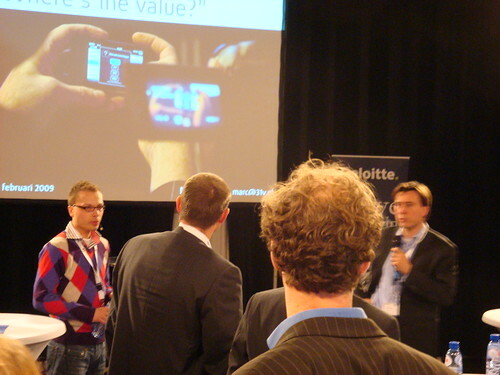 Thanks to my role in Mobile Monday Amsterdam I was invited to share my view on the state of mobile advertising at the Deloitte Predictions event. Because I’m no expert on mobile advertising in general, I made the link with Service design. The subtitle of my presentation was “where’s the value”. I think a lot of companies don’t have a well enough understanding of their target group. They focus too much on creating value for the company, so much that they totally loose sight of where the value is for the users -if there is any value at all for them-. If there is no value the user you can forget about creating value for the company. The issue with mobile is that it’s not just another media channel where the same rules and laws of advertising apply. Delivering relevant content / services on mobile is a whole different game then it is on the good old internet. After my presentation we had an interesting discussion with the audience on this subject. Here are the slides (in Dutch), unfortunately I had to cut out the videos.